Summary: Topaz, Black Knight, and Hellstrom take down cultists. A wave of dark mystical energy washed over the skin of the Earth. Energy so foul, it made many of those sensitive to magic violently ill; such that they would convulse and vomit. Worse, what came out was a sticky black ichor that carried a putrid stench of decay. If one were to stare into the inky black pool, they might have seen what is best described as tendrils writhing over Gotham City, specifically Mercey Island and Arkham Asylum. The imagery would fade as the ichor began to evaporate into a dark steam. Arkham Asylum stands upon the rocky island of Mercey within the northern reaches of Gotham City. It is the cold winter night, and the apex of the winter solstice. Dark clouds hang over the city. The oil and electric lamps that once tried to fight back the darkness have faded. Arkham is nearly pitch, shrouded by a deeper darkness that is of a magical nature. Albeit, those with magical sight are able to discern antumbral illuminations around the corners of each brick corner, beam, spire, or dome. The area is charged with a feint static. Such that the ground seems softer as the dirt wants to move away from other dirt. Each step that's taken, motes of dust take longer to settle back down, and one's skin will feel a slight tingle or vibration when touching other objects. There is also the foul scent of stagnation that hangs within the air; something akin to the flesh of a decaying ox. It is carried upon a fluctuating wind that one moment it will be a soft breeze, the next a violent torrent that threatens to knock one off their feet. Both extremes are fleeting, and quick to subside. The sounds of the city beyond the island cannot be heard. Sound, when generated carries a dull dampening vibration to it. Therefore, voices can be carried over distances, yet, they often come across as monotone. 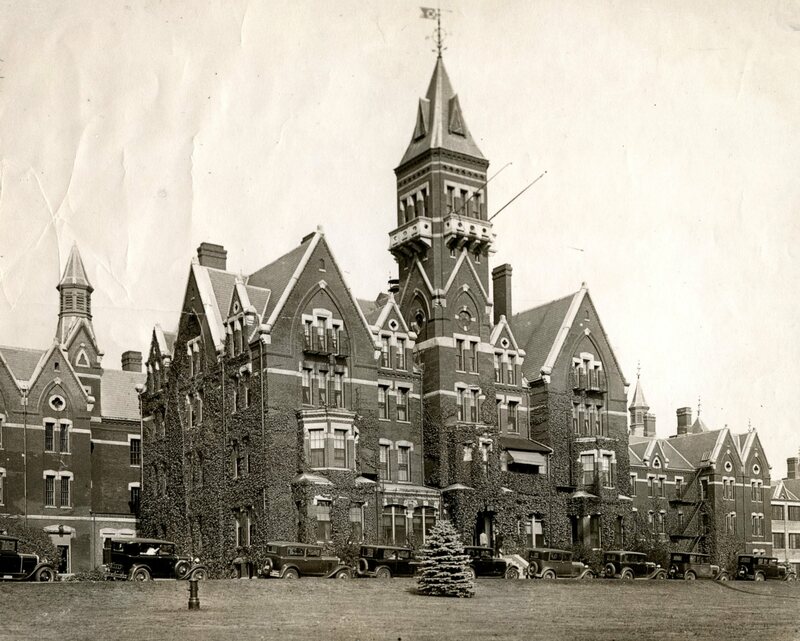 Outside the asylum, along the road and parking areas, there are a string of motorcars and various persons exiting them. Other persons are seen walking out of the nearby waters toward the main entrance of the gate. All persons move slowly, shambling even, toward the asylum itself. None carry illumination. There are approximately 30 to 40 which are visible at any given time. As they enter the asylum, they disappear into the darkness within. Daimon Hellstrom can be detected atop a rocky outcropping along the shore. He's within 100 yards of the main entrance of the asylum. He is knelt, shirtless, and holding his golden trident which lays nearly horizontal to the ground. Hellstrom watches the people move toward the asylum. Whether from Hellstrom or the evidence of evil oozing from Arkham, Black Knight arrives. Currently the mantle is worn by Octavius Garrett, who came under the influence of the family position with the past decade or so and has begun to succumb to the Ebony Blade and its curse. The sword that must draw blood once unsheathed and that drives the wielder with the desire to unsheath and draw blood. The lure of evil was a good temptation for Octavius. He carries a flask near his sword, linked to his weapons belt. As if some struggle for control and he finds his anchor in drink. Perhaps curiously noticing the golden trident alerts him of the presence Daimon. Thus, he makes his way along the rocky outcropping, avoiding notice by the Aslyum a hundred yards away, but not to hide from the shirtless man (half-ish man?). "Should I not be surprised that we keep the same company," he says quietly, focused enough to move to kneeling to keep lower profile, "I can't imagine you've simply with the hopes to draw blood alone." Sure, evil a foot, something going on, but presently the Black Knight's interest is less then pure it would seem. Briefly glancing back, Hellstrom takes note of the Black Knight. His eyes quickly return to the people moving into the structure/grounds. "Quite true. ", he responds. Then follows with, "Something summons the Deep Ones. Something quite dark and foreboding. A darkness that I am vaguely familiar with, but well beyond the realms of my own." Two figures fade into being as they walk out if a mist that wasn't there moments before. A middle aged man and a much shorter, blond haired teen by appearances. "This is the place Taboo." she clutches the older man's arm with one hand as she clutches her stomach with the other, "Does the evil not effect you as greatly?" the girl still seems to feel queasy from the dark evil that inhabits the area. "No, not as strongly child." he answers in an accent that is hard to pin down. "You always had a better sense of that than I?" The pair survey the area, to those of magical senses they have an aura about them, something akin to a See-Me-Not, but limited to those that wish to do them harm. Kneeling and scooting closer to Hellstrom, Octavius nods, "Beyond your own, is this something we stand a chance against …" His musing is stopped as a mist descends or simply parts, though perhaps affected by the See-Me-Not that he doesn't realize others are arriving. As if shaking off that deju-vu, he reaches for the flask at his side. Uncorking and continuing, "I mean to draw the Ebony Blade, but if odds stand against us, I need to know there is some chance this Something Dark and Foreboding will not fester with these Deep Ones …." He takes a drink then, offering the flask towards Damion. Hellstrom reaches with his free hand to place upon the forearm of the Black Knight. In this, he opens BK's eyes so that he may see more clearly upon which he gazes. 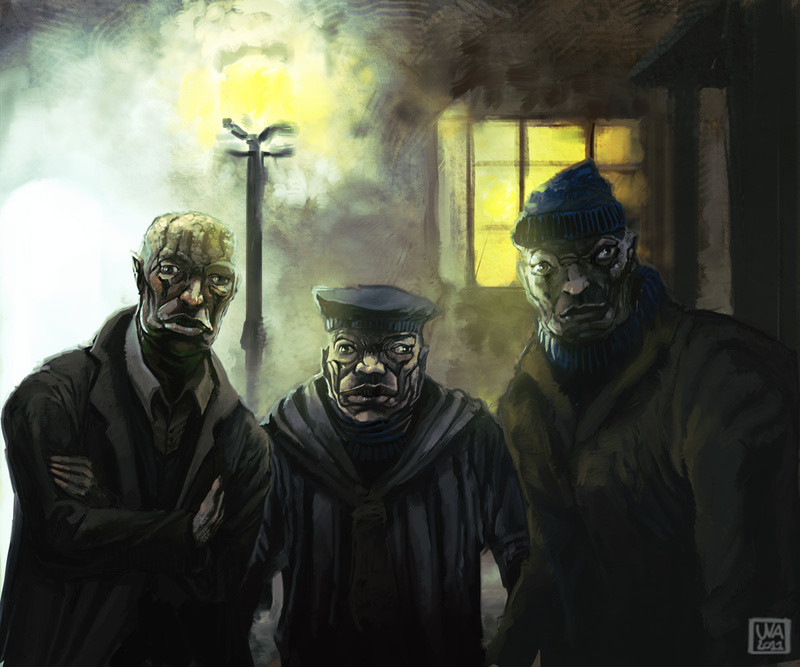 The Deep Ones, at a distance and to the casual observer, appear to be oddly shaped humans (deformed perhaps) wearing clothing common to the era. But with eyes wide, one will see them for their true nature. Hellstrom intones, "Look closely and see your enemy. An enemy that can be vanquished. Splitting the rubbery skin will reveal an ichor of slime and disgust for they are spawn of R'lyeh, an elder god from beyond the stars. They are strong, resilient, and have sharp claws as well as rows of jagged teeth. Beware, if you are bitten, you will be transformed into one of them. No means of saving you from your walking death throws. They are but the army of what ever is summoning them. In times before, when my feet last sat upon this foul island, I faced a cult. A bevy of would-be sorcerers that wished my father's power. They were fools and with the aid of the Woman in Red, Mystique, and Sister Satan, the mortals were dispatched. Though I fear that a new, more powerful cult has taken up residence in this despicable place." "We are not alone here Taboo. There are others." the young woman points in the direction of Hellstorm and Black Knight and Taboo narrows his eyes up at them "The current Black Knight though the other is unknown to me." the man in the fez replies back. Topaz rubs her nose "He reeks of demon. I can smell it from here." The comment causes the man to laugh "Well it won't due to tell him that. They no doubt here for the same purpose as we, shall we join them." his hand goes to the girl's shoulder and the other hand makes a gesture as he speaks words of power. It seems for a moment, the pair are stretched across the space between, being both where they were and where they are going at the same time for a brief moment. "Gentlemen." Taboo greets when the pair completely manifest near them. Looking up at Hellstrom, it might be apparent he could see the Deep Ones arriving by the raise of his brow, but he takes the explanation all the same. Its more Taboo and Topaz under the See-Me-Not glamour/magic were beyond Dane's senses. Not that he meant them direct harm, but he is suffering the blood curse and it might toggle his senses a little. "If they can bleed, they will fall, they can blunt their teeth upon my blade," he says, taking in the history of the location from Hellstrom, noting some of the names of those who helped before with this cult he speaks of, but pauses. About to say more perhaps, Taboo and Topaz approach and he can see them now, especially since the come near stepping briefly across the space to be close at hand, but also since Hellstrom gave him some mystical sight. "It seems help is arriving then Damion, the stench spreads downwind from these Deep Ones." With a nod of his head, "Hello." Hellstrom's attention is gained by the arrival of the man and young girl. Hellstrom seems to know of Taboo, if not by reputation and he states, "Now all we need is the Phantom Rider and the AntiChrist and we'll have an Apocalypse done right." His tone is that of comedy mixed with tragedy as he eyes the girl for a moment longer, his demonic eyes penetrating her soul to taste the purity. Souls don't get any purer than Topaz's, and her's is quite different than that of your run-of-the-mill human. She seems to be able to sense the invasion »>Now is not the time for that.«< she admonishes Hellstorm in a telepathic broadcast for all to hear. It's enough to put Taboo on guard and he shuffles closer to his protege "The girl may be young, but she is correct. The time for standing around is past. We must enter the maw of evil and cut it's blight from the world." The penetrating gazes, its return, is beyond Octavius. The Black Knight merely stands idle for the moment while Hellstrom chides of others that should be around when Taboo arrives. Likewise for the response of Topaz after said gaze even, in his head, not new but not something he was much a fan for either. "This dark and foreboding something that calls them, it is something in the here and now?" Something to worry about - more meaning are the coming to help summon it, or is it already here and thus why more and more are gathering. Cutting evil from the world he is ready for, more checking on the scope of that evil simply to be prepared. Hellstrom smiles to her response and disregards what nefarious things and what her purity would taste like. His eyes return to Taboo and then to the creatures in the distance. His comments give light to the situation, "If I were to hazard a guess, the Deep Ones are summoned to give energy to a summoning ritual. An act that must be stopped before it awakens the focus of their desires. Keep the child close. This is no place for her, yet I know you will not send her away. Know, that if they were to lay their hands upon her, their corruption would be legendary." Hellstrom rises and begins moving toward the converging Deep Ones. His trident is engulfed in flame and he calls out, "Hey Ugly! Give me back my amulet - you know the one. That which you took from my grasp 6 years ago!" "You need not speak like I am not here." Topaz tells the two men, in the same admonishing tone her mental voice had. Taboo winces at Hellstorm's words "I wouldn't go there. My protege does not take kindly to those that try to tell her, her place." he looks at the girl and the withering look she is giving Hellstorm at his words "You know what to do my daughter." the girl nods "I do Taboo." hands and eyes begin to glow gold and a similar aura surrounds her as she takes to the air. Words of power begin to fall from her lips as she flies above the Deep Ones. Bursts of flames leap from her hands into the masses of the shambling evil creatures. Taboo, leaps from where they were standing and drifts slowly down and makes his way toward the entrance to the Asylum. Not at all heeding the words of Hellstorm and keeping the girl near. "Yes, we all love each other, like the spread of socialism in Europe," mutters Octavius, taking another swig from his flask. As they chide one another about who is doing what and who is protecting whom even. Putting it away he reaches for teh Ebony Blade as Hellstrom leaps to issue challenge, Topaz takes to the air and Taboo heads for the entrance itself. "Glad we settled on that plan, lets see if their blood abates the blade then?" Not that any listen, but he smiles when the blade comes out. Doesn't even have to try and keep his wanton abandon with lopping off bits at bay with these things. He leaps up and then has to make his way down the cliffside, in leaps and abounds. Hopefully they turn this way at Hellstroms beck and call. Their clothing bursts into flame, but their rubbery skin does not burn. Instead it drips away onto the ground below. The creatures are however annoyed, scorched, and intend to rip limbs from their attacker's frames. They turn and begin shambling toward those that are on the ground. They move as fast as a normal human, just oddly. Hellstrom drives his flaming trident into one after the other. The trident pierces them, making them bleed. He rends and tears their rubbery flesh. His flames do little as well. Other than serve to annoy. But the trident itself does the damage. The Black Knight will find his attacks most effective. Slicing through the black skinned creatures is quite easy with his blade. He will kill them much faster than the fire or the trident. The attention has been drawn, those that were inside (close to the mouth of the asylum) are now exiting to take on the challenge of those that they can assault. Topaz stays airborne and out of the reach of the Deep Ones grasp, with the flames doing little more than annoying she changes tactics. Her words change as levinbolts begin to rain down on the evil creatures. That odd meteorite that forged the Ebony Blade, it feasts well as it cleaves the Deep Ones, the artifact stands true. Feasting upon blood and slicing where its wielder swings it. "I imagine our fight is inside," yells Black Knight on the battlefield as they make fight with the slimy, festering ones. Happy to taste blood, yes, but there is a goal somewhere, inside as he recalls. "I can stand fast to buy someone time …" An offer to stride for the middle of the throng if someone needs to go after the summoning ritual itself. Then again, Taboo seemed overly focused on getting to an entryway. The lightning dispatches a deep one within 3 seconds of charging the creature. Causing it to explode the black ichor in all directions. Splattering those nearby and leaving a black icky spot upon the ground. Hellstrom exclaims, "You speak the truth, Black Knight. Let us press the battle inward." With that, Hellstrom continues pressing toward the main entrance to Arkham. 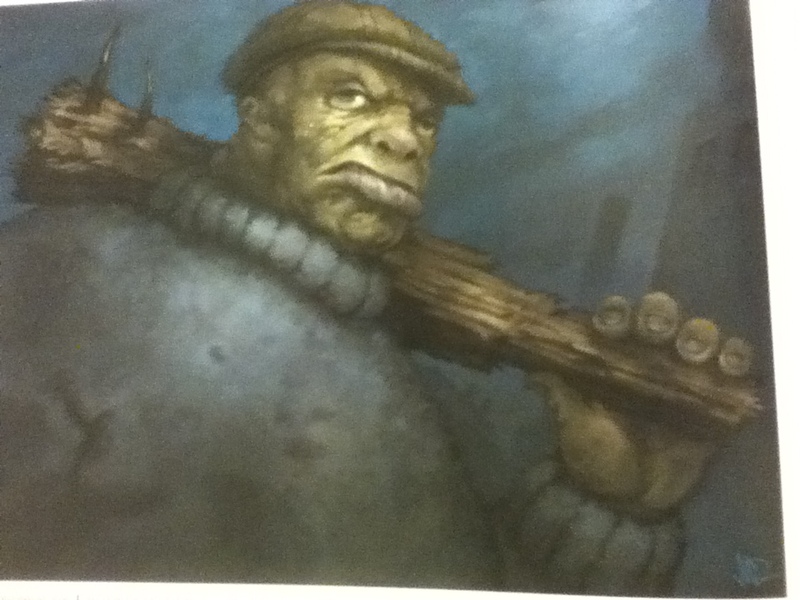 Deep ones are skewered left and right. Good times. The young woman has been making her way after Taboo while she is tossing her levinbolts left and right "Black Knight to your left." Topaz calls out sending a bolt at the creature that was about to attack him. It doesn't get the chance, as it gets all explody "We must make haste before whatever is being summoned crawls its way out of the abyss." Turning at the call of Topaz, "My thanks," he says, swinging the blade but connecting with a slumping creature. He can use the blade to sweep closer ones closing at his back. As they suggest going forward, he moves to that left flank Topaz opened. "Onward friend, to me foes!" A yell to distract and pull the bodies to him. He knows he can deal with Deep Ones, but stopping what's inside is their realm, those more mystically aligned than him. Moving that way, but trying to let Hellstrom go first, and Topaz fly ahead the same. The four of them are able to move into the main entrance of the asylum. They then are forced to wade through a sea of Deep Ones who could in the hundreds. It is not a pretty battle, quite messy in fact. But no one is bit, just coated in the black ichor blood like substance that courses through their veins. When they penetrate the inners of the asylum, they will discover various rooms that are being utilized by indescribable creatures to experiment on human subjects. The humans are all in various stages of dissection by the creatures who have tendrils, lobster like claws, and misshapen bodies. All are different, all seem to be hostile in some way, but most are easily dispatched by the blade, the trident, or the bolt. Taboo is a formidable sorcerer in his own right, and has been holding his own against the surging Deep Ones. When they catch up he is surrounded by a arcane shield, his own magical attacks taking down scores of the shambling creatures. "About time you caught up." he says joining them in their dash to the inner areas of the Asylum. "You are unhurt Taboo?" Topaz asks with concern as they make there way through "Worry not for me child, but for the poor souls who are being tortured in such horrible fashion." Topaz has seen many atrocities despite her apparent youth, but this is the worst she has seen yet, she looks ill at the sight of it "Such misery and pain." she holds her head with a hand a moment before she steels herself, following where the others lead. As they make it inside, to reveal the first horror awaiting them, Dane gives blade to the resistance there. But as they take in what is to behold, the resistance lighter, he doesn't answer to much as move to drink from that flask he has with him. A few gulps even, something to focus on other than human remains and entrails. "Let us not linger, least we give pause to our quest and others succumb to this monstrosity." More that he has no clue which way to go either, he has a sword, he will hack at any monster, but he doesn't know where to begining to find where the ritual might be taking place. The cult is found in the central hall of the asylum. Albeit, they are surrounded by larger foes of significant strength. 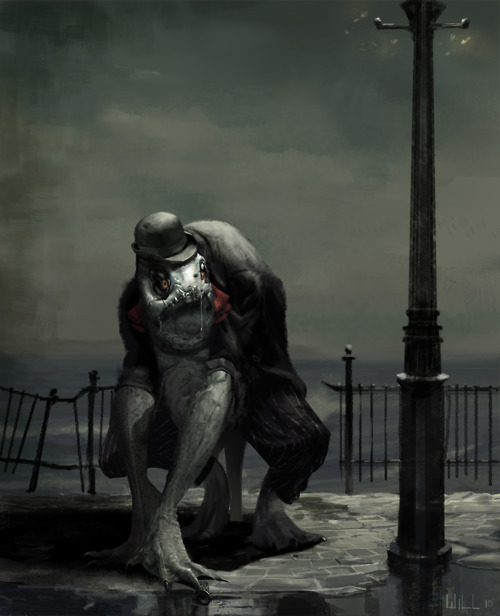 Creatures that stand like men, but at heights of 8 or 9 feet and have deadly hooks for hands. The creatures will lung at the would-be-heroes and the battle will ensue. Again, the Black Knight has the advantage with his mighty sword. Hellstrom has reach with his trident. Topaz/Taboo have range with their casting of spells. What are they actually fighting for? In the center of the gathering hall are detailed symbols carved upon the floor. A large area is open with the various magical glyphs encircling it. In the very center of that open area is a black portal that is slowly opening. Deep Ones surround the borders of the room and immediately around the scribed circle are 9 cultists. They all wear black robes with the same main symbol marked upon their chest. They chant with hands raised as they try and summon an elder god. Hellstrom states the obvious, reiterating everything everyone else has already said. "We need to take them out before that portal lets in the big nasty. Because there's no army in hell, heaven, or upon this mortal plane which can stop an elder god." "I can take out the cultists with ease." the young Topaz states with confidence, she is proving to be much more powerful than her stature and apparent age suggests. "I will cover you my daughter." Taboo moves to her side hands dancing as a spell is cast around them, another arcane shield to protect them as they each do their part. Topaz's hands glow once again and she focuses her formidable TK abilities, grabbing each of the nine cultists around the waist and lifting them from the floor before giving them each a violent shake and tossing them toward the larger demonic creature. Meanwhile Taboo, his fez sitting askew in his nearly bald head, chants words of power aiming a Banishment spell at the closest large demonic creature. Not that he could help with cultists, considering demonic creatures are a barrier and he is only limited to melee, Black Knight is just as quick to take up the fight. "If they can be cut, my blade shall feast upon them," he says, moving to be the same barrier they serve. Moving to put up defense for Taboo and Topaz, but pushing it offensively. Driving at them before they can make the same approach. "I care not to see this big nasty Damion speaks of this evening, my mind is filled with enough gruesome thoughts for one day." He'll have to be more careful as they have the hook-like hands, simply not wading through with wild swings but having to advance, block or perry. The advantage of the blade is it can be used to slice defensively, turning hooks and arms swung his way into his own attack to let them smash against the Ebony Blade if they dare. The Blade is black, it has no blood or slime, as if it runs off or is absorbed by the artifact. The cultists are shaken senseless while bones are being broken. They scream in rage and some struggle to break free before they are tossed at the monstrous creature. 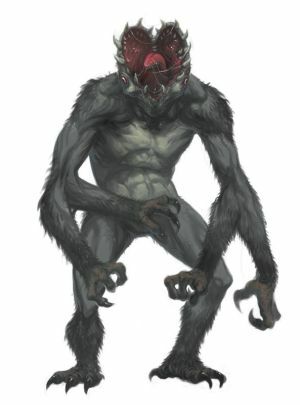 Taboo is able to banish one of the larger creatures without issue. Meanwhile, the Black Knight and Hellstrom slice, pierce, and dice various creatures all about. The trouble with portals. Now that the cultist are no longer focusing on opening the portal and bringing their elder god through, the portal threatens to become unstable and close. Before it does, one may spot a large (10' diameter) fish-like eye looking through it. The eye fades back and then a long writhing tendril reaches through in an attempt in grabbing the pure Topaz for a tasty snack. Taboo begins another Banishment spell ready to send another back to where it came from when the tendril whips from the portal. He grabs Topaz at the same time the tendril wraps around her waist "No daughter!" he yells "The elder god shall not have you." Topaz's scream in surprise is short lived as she becomes the target of a tug-of-war between sorcerer and god. Instinct kicks in, glowing hands go to the tentacle around her waist it is not the only thing that can feed on energy and she begins to siphon the life force of the elder god. If she were a mere human sorceress this would be certain death, but as she is part something else, what she hasn't found out yet, the risks are only 50/50. Not that he would ponder entering such a tug-of-war, but maybe something in the Blade dances with delight. The Blood of an Elder God, it coming through enough to not readily go into the dark night. Hellstrom might already be onto the same idea, an attack at the tendril so that it retreats for the portal to collapse. Octavius isn't thinking of collapsing portals. He's thinking to spill the blood of a god. His smile more sinister with this new desire driving by the Ebony Blade, he will dispatch any foe that may stand betwixt him and tendril simply to have a chance to make such a strike. That it may benefit the tug-of-war is beyond him in that moment that he makes the charge, only bringing blade up high to swing down when close enough to not be completely open to demonic creatures the same. Hellstrom levels his trident and as he yells mightily, his trident launches a blast of hellfire toward the origin point of the tendril. The Black Knight's blade slices into the tendril, but not through. Topaz's glowing hands serve to drain life energy, but it is from a god, therefore universal. So a whole lot needs to be drained over the course of 500,000 years. Taboo begins the closing of the portal. Which is the most important part. The portal shrinks rapidly, the tendril releases Topaz and retracts quickly. However, the portal closes before the last 3 feet of the tendril can retract. It is chopped off. It strikes the floor with a heavy splattering thud. All around, the Deep Ones begin to flee. They know they have failed, and they must live to try again another day. The life energy is enough to recharge herself and her mentor, who Topaz siphons some to as well as he starts the spell to close the portal. The fact that she does it from where she fell to the floor doesn't seem to bother the girl at all. There is still that content grin on the face of the Black Knight, his blade tasted the flesh of a God. Certainly not enough to cause it harm, if but a scratch on that tendril that is only truly felled when the portal is closed by Taboo, assisted by Topaz with the new energy siphoned from the god as well. 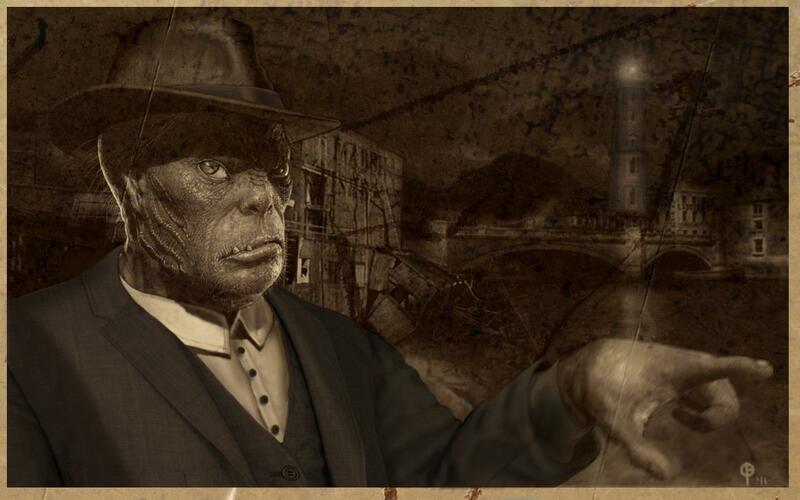 The Deep Ones flee. He moves to make sure nothing else comes to where they are, but he does sheath the Ebony Blade, the curses' appetite satiated. His thirst for alcohol, not so much, as he offers, "All that is left, is to make a night of it now." Ie, hit a pub (or speakeasy, exact year dependent). Hellstrom begins walking toward the hunk of god flesh upon the floor. He spikes it with his trident and lifts it up, "This will make a fine trophy." is stated to himself so that the others may hear. Hellstrom claims a trophy, Topaz and Taboo go to do something serious, like getting the Deep Ones out of the old Asylum. Octavius shrugs, goes for the flask. He uncaps then drinks, drinks it dry. "Nothing left for me here," he says, then, tossing it amongst the refuse of cultists and slain demons. Not taking a trophy, disappointed, blood had, none left to take, alcohols had, no left to drink. "So, we should plan to meet again, not that I think we're the sort of group to make plans - or the sort to make groups. Enjoy the trophy." He simply starts walking for the door.